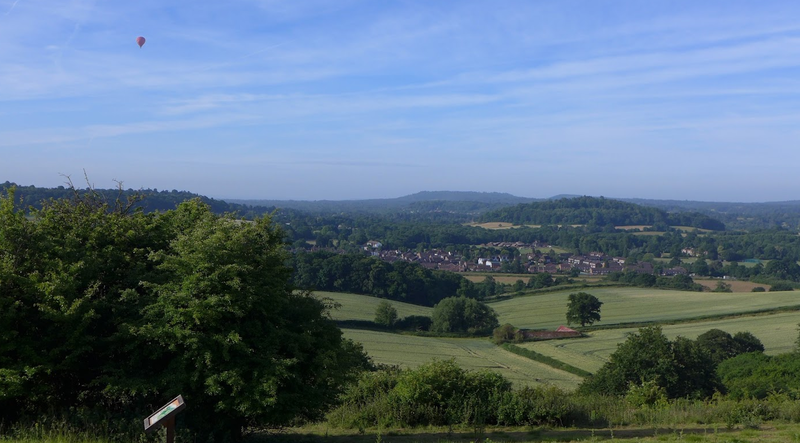 June in Reigate, Surrey continued the Summer 2015 theme of mostly cool, dry and sunny but with an unsettled start and THREE attempts at continental heat from Spanish Plumes in one month. (please note that the chart above hugely exaggerates the rainfall.. check the rain scale in mm. I have yet to fix down the scales month on month!). The month started unsettled with a deep low pressure 976mb crossing Scotland from a very much cooler-than-usual North Atlantic bringing brisk winds for the time of year and comparatively cool temperatures. Another Atlantic LOW crossed Scotland through the first week 991mb (see satpic). A weak first attempt at a Spanish Plume 5-6 June developed ahead of an Atlantic cold front and gave some limited thundery activity early morning on 5 June, these cells went on to become more significant further north east over E Anglia. Pressure rose thereafter as an anticyclone built firmly over the UK. This HIGH eventually slipped north and a heat LOW from Iberia brought the threat of a second Spanish Plume around 12-13 June. 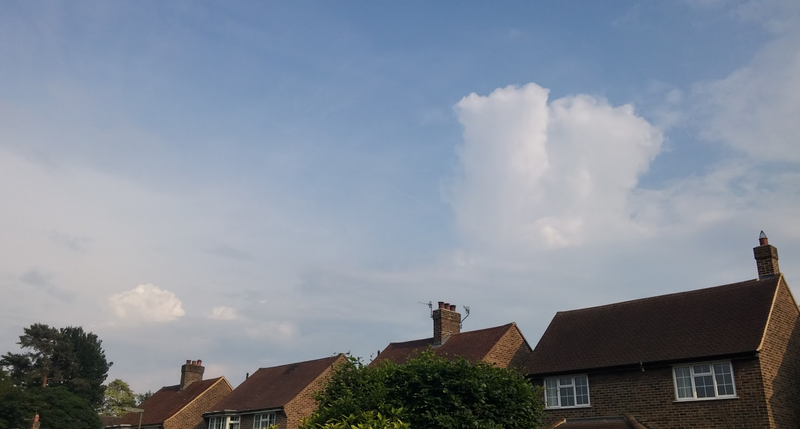 This misfired and caused little convective activity over Reigate at least. This turned out to be a significant mis-fire for convective forecasters, despite some limited activity here and there the overall level of activity was low and certainly nothing occured over Reigate except very late in the day when some congestus puffed up. High pressure built again with weak fronts skirting across the SE bringing some pleasant mid-level and upper level cloud, nice sunrise and sunsets and some good atmospheric optical phenomenon at times. Towards the end of June a third attempt at a Spanish Plume yielded more heat and more purposeful thundery activity that eventually spilled over into decent thunderstorms into the start of July. This was a modified Spanish Plume and more details can be found on the post written up here and here. 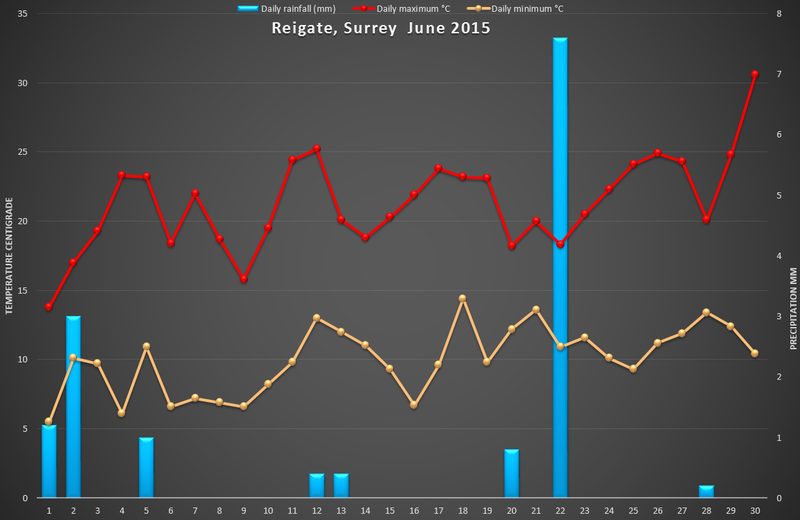 The end of June 2015 heat spike produced some 30C+ temperatures and in Reigate 30.6C was recorded on 30 June. 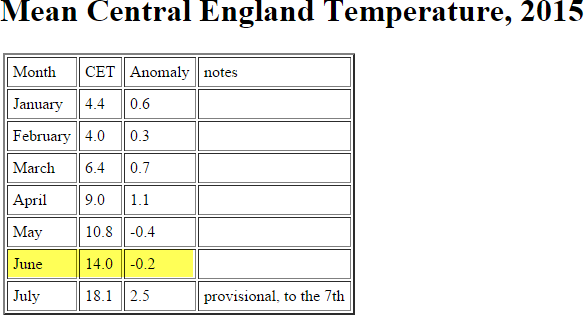 Overall the month was sunny but a shade cooler than average according to the CET central england temperature record. The UK anomaly charts reflect the overall dry pattern with notably little rainfall for the month. In Reigate the total rainfall measured was 15mm. Although this June was not consistently hot tp push up the CET (central england temp), we did nevertheless have episodes of unusual heat, especially at the end of the month with the end of June / early July heat spike. This heat wave was more severe and prolonged in Europe. A “cause” of the Euro heat wave, with significant heat in Spain and Portugal, was an OMEGA BLOCK or “shruggie” that built through June and lasted into early July. This Omega Block pattern may also be linked to rapid melting of the Greenland icecap that has been recently reported as heat builds there under high surface pressure. A really good summary and some lovely cloud pix. The take home for me is not the heat or temperature swings but the conti uance of substandard rainfall in the south. I know my garden is crying out for a proper wet day not a passing thunderstorm (as fun as they are to watch). It will come but when?